Did you watch that movie too much when it first came out? So did I. And then you couldn’t watch it anymore because it was all played out? Me too. Can you still quote the whole thing? Same here. Does it still depict your family perfectly, right down to the bundt cakes, resorbed twins, and seashell lamps? yes. yes. and YES. 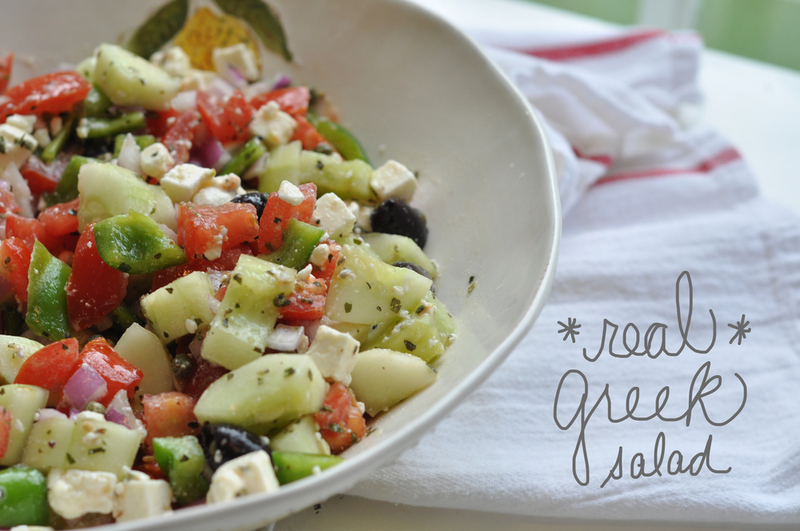 Our Greek friend, Ioannis, told us how to make this salad several years ago. Apparently, people, we are doing it wrong. There is no lettuce in their salad. The dressing is simple and full of briny goodness. If you are eating bread these days, you should grab a sourdough baguette and sop up the salt-watery, soupy goodness. Don’t let the juice get left behind. Ioannis says it should taste like the ocean in there. He was right. We were doing it wrong. This is pretty much amazing. It's summer food at it's best. Make it for dinner tonight. You don't have to be Greek. But you'll wish you were. Opa!!! Make this for: Breakfast. Lunch. Dinner. Midnight snack. For-a-good-cause carwashes. Crabfeasts. Potlucks. Baby showers. Weddings. Funerals. Dinner parties. Church picnics. Date nights. Backyard barbecues that turn into wine-tastings while you stargaze. Chop up all your veggies into bite size pieces and place them in a pretty bowl. Add capers with a little juice from their jar and kalamata olives. Season liberally with ground salt and pepper, and oregano. Mix everything up. Chop and crumble feta on top of salad (but don’t mix it up yet). Set timer for at least twenty minutes (up to an hour). Add olive oil, to taste. Make sure there are plenty of juices in the bowl. If you are going to refrigerate it, take it out at least an hour ahead of time so that it is close to room temp when served. May 24 Is It Worth The Trouble? Good Question. You Get Cake.